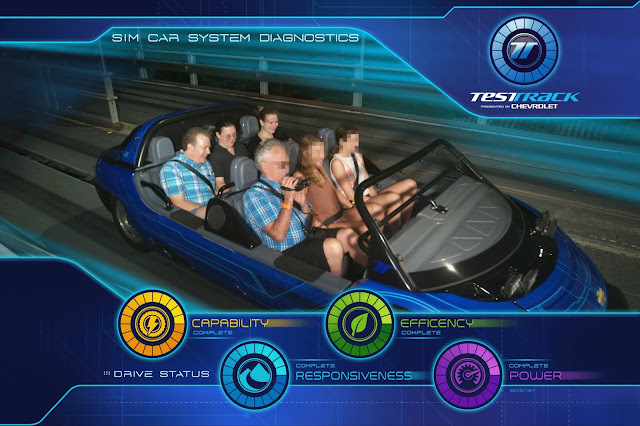 Ten Things of Thankful: Vacation Slideshow Edition! Back in the old days, before some of you were born, people used film in their cameras; digital photography hadn't been invented yet. Sometimes that film was developed into slides rather than photos, and friends and family would gather together to watch a slideshow of their vacation. I thought I'd take the slideshow approach to this week's Ten Things of Thankful post, but while I get the slides loaded into the projector, let me set the stage. Feel free to pop some popcorn and find a comfy spot on the sofa while I give the background. 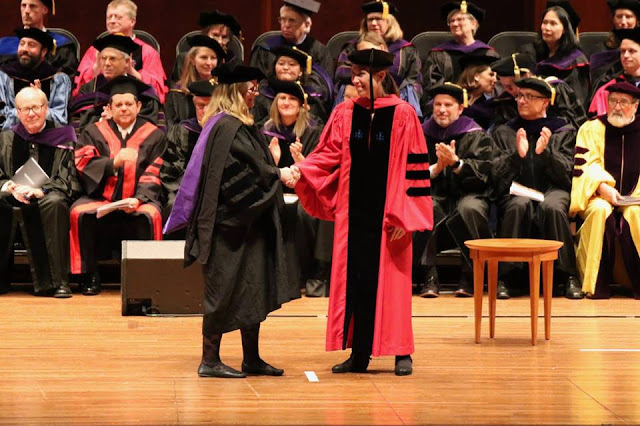 On May 25, my oldest daughter carried a suitcase with her to her final exam of law school. As soon as she finished her test, she flew from Seattle to Salt Lake City. We met her at the airport, slept for a few hours in the house we are moving into, then returned to the airport and flew to Orlando. 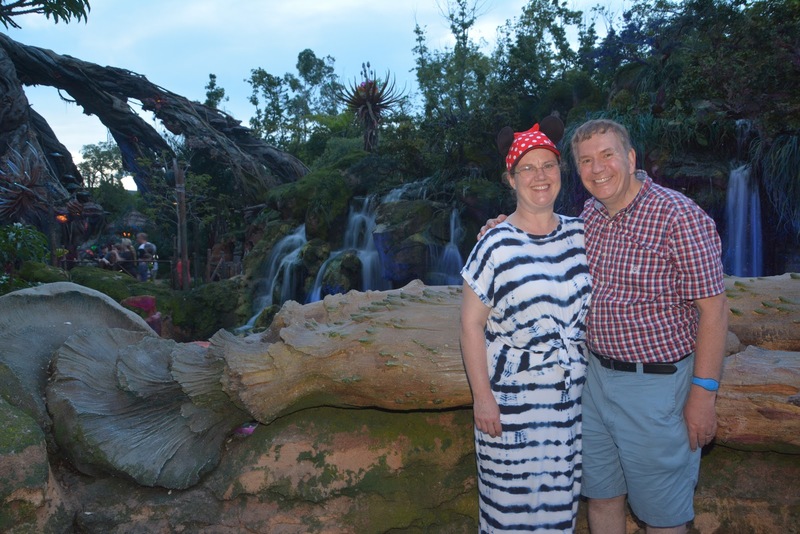 We spent the next week at Disney World, then hopped back on a plane bound for Seattle. The next day, John and I (along with some other family members and friends) watched our daughter graduate from law school. John and I stayed in Seattle for a couple of days, then flew back to Utah. Oldest daughter now has her nose in books as she prepares to take the bar exam, and John and I are settling back into our regular life. that the Fairy Godmother's sleeve was full of little papers. 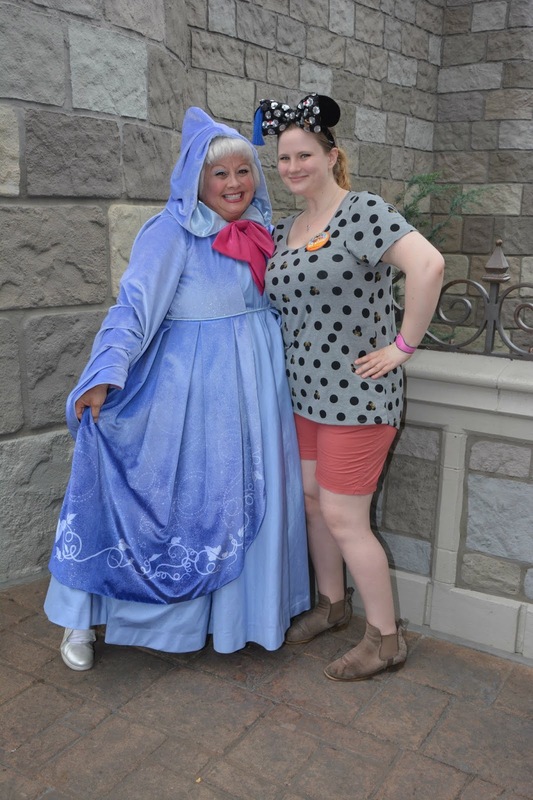 The Fairy Godmother's sincerity endeared us to her. After we returned home, I stumbled across an article that showed me that I'm not the first one to witness her caring manner. I'm thankful for nice people, who go above and beyond. Now, of course, not all Disney characters are so sweet. No matter; memorable encounters occur with others, too. 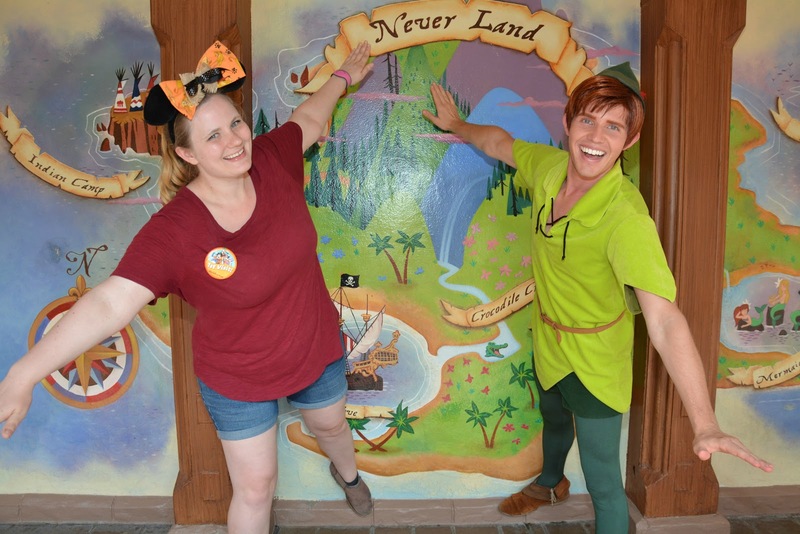 When my daughter pointed up toward the sky when posing with Peter Pan, he said, "What are you doing? You look like a dork!" He then demonstrated the proper way to fly. We laughed about that for quite some time. Photo: Peter Pan instructs my daughter on how to fly: arms out like an airplane, back foot lifted. Our daughter is not one to let her heart rule her head, so this next photo also makes me laugh. The villain Gaston is not her type at all! 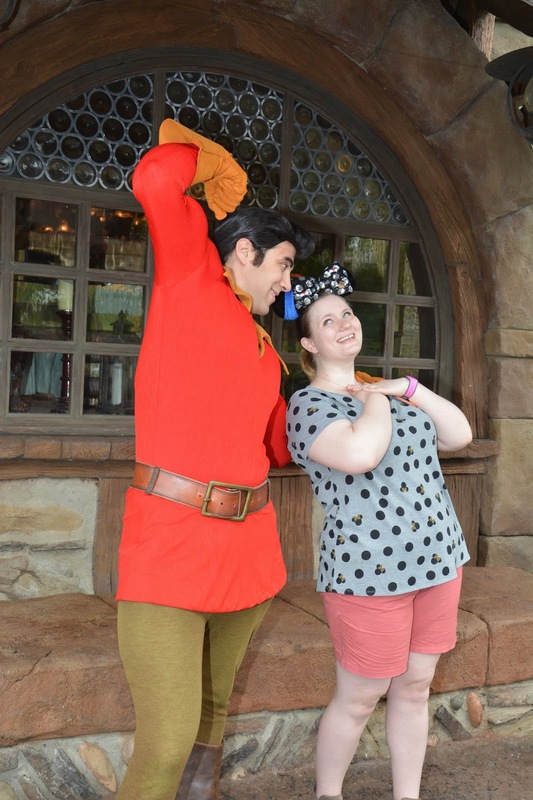 Photo: Gaston shows off his muscles while oldest daughter looks up and swoons. I'm thankful for those who obviously enjoy their jobs. We didn't just meet characters; we took time to ride the rides as well. Some of the attractions have cameras set up to capture action shots. A couple of the photos made us laugh. Photo: A vehicle traveling through the Dinosaur ride. On the back row, oldest daughter, John, and I look less than enthralled. On the middle row, three women smile, while one of them covers her daughter's eyes. 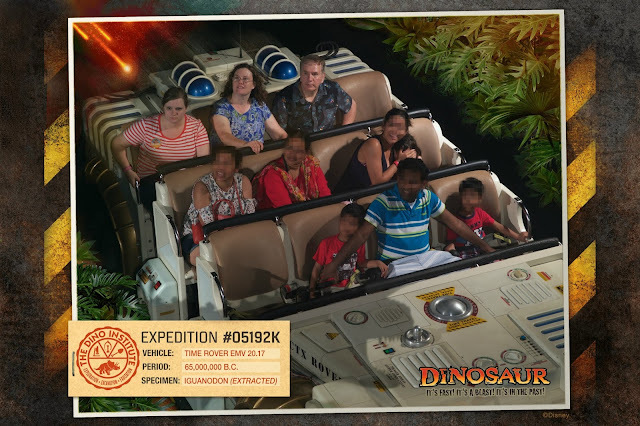 On the first row, a man throws his arms across his sons, as if to protect them from the animatronic dinosaurs. Photo: John, oldest daughter, and I ride in the back seat of a blue car on the Test Track ride, while in the front row, a man sitting in front of John wears a blue plaid shirt that is nearly identical to John's. I'm thankful for humorous moments. Speaking of humorous moments, we witnessed another one while at Animal Kingdom. Let's let the slide projector rest for a moment while we watch this video I captured of two young gorillas with their dad. In the video, one of the young gorillas saunters up to his dad. The older gorilla has his back turned. His son gives him a quick shove, then quickly retreats. The dad ignores him. I guess children of many species challenge their parents every now and then. I'm thankful for animals, children, and their self-development. OK, I think the projector is ready to go again. 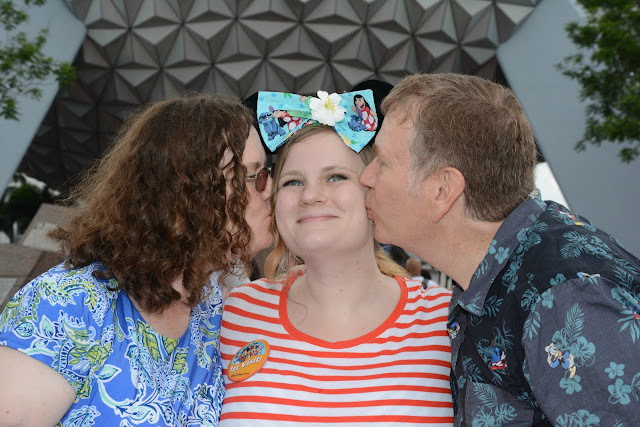 Our week at Disney World was great, and we enjoyed being able to spend time with our daughter. Photo: Our daughter smiles as John and I stand on either side of her and kiss her cheeks. I'm thankful for oldest daughter. I'm thankful for our daughter's determination and hard work. I'm also thankful for my brother's photography skills, which were much better than mine for this occasion. 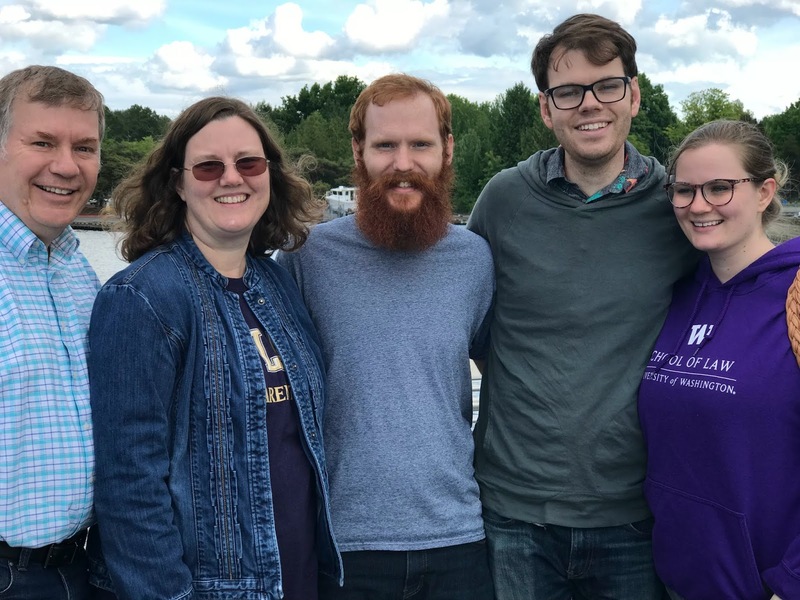 One son lives in Seattle, and the other son came up for the graduation, so we enjoyed being able to spend time with three of our children. We visited Chihuly Garden and Glass and were amazed at the beautiful glass creations. 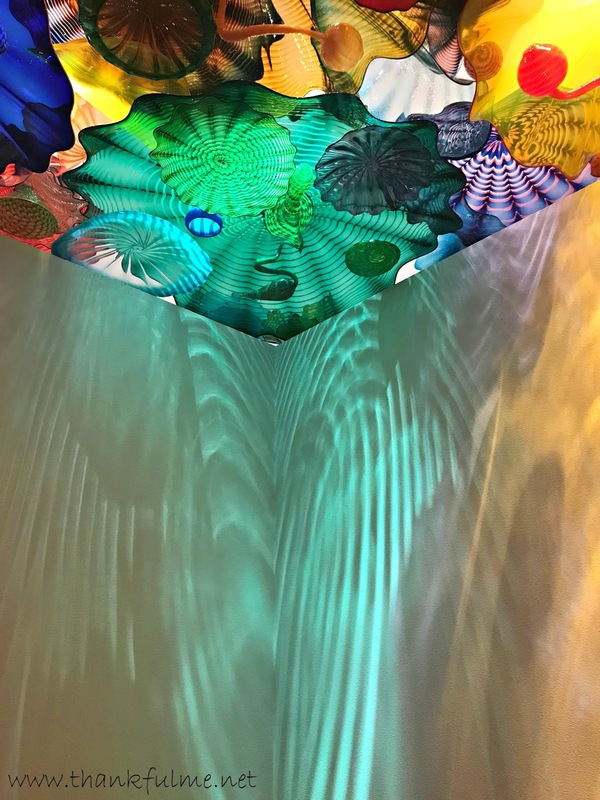 Photo: light shines down through a glass ceiling of colorful glass bowls, spheres, and other objects to create aqua and purple light patterns on the walls. 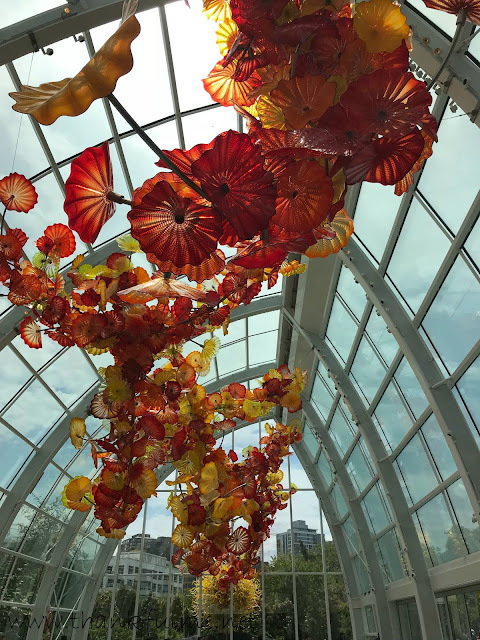 Photo: Large red, orange, and yellow glass flowers hang from the glass ceiling of a sunroom at Chihuly Garden and Glass. 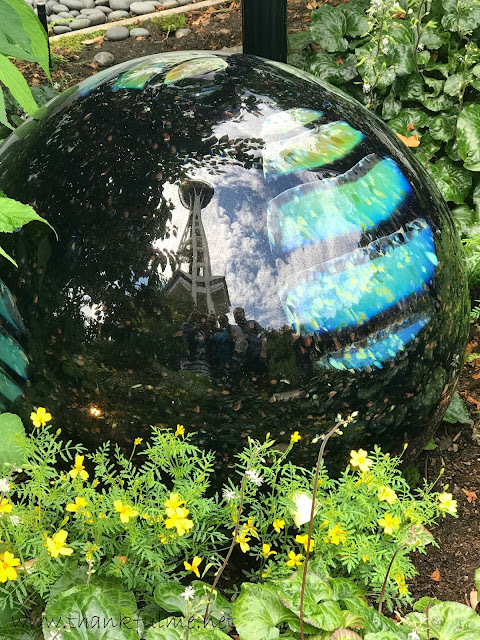 Photo: A glass sphere in the garden reflects the Space Needle and us taking a photo. I'm thankful for the talents of a master craftsman, and the opportunity to view his beautiful glass artwork. No trip to Seattle would be complete without visiting the waterfront. Not to be content with just one lake, we stopped at Union Lake, Lake Washington, and Green Lake. I'm thankful for the opportunity to see so many of my children at once. Our time in Seattle was short, which is probably for the best because every time we are there, we get the urge to buy a house and relocate. (The housing market is a great deterrent now, though!) Soon John and I were on our way home. Mt. 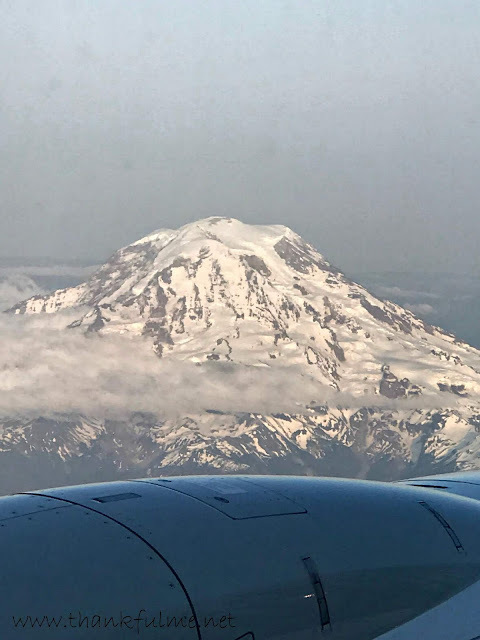 Rainier was out (that isn't always the case; it's often under cloud cover) and I snuck a photo from the plane. I'm thankful for John and all the adventures we've had over the years. Photo: John and I stand in the Pandora area of Animal Kingdom. Thanks for humoring me with this vacation slideshow. I fear a little bit that my posts of a great vacation could paint a picture that is all-rosy. I did not throw in photos of blistered feet and torrential rain. I do not write of many of the struggles that are chronic but are not mine to share. I put worries on the back burner and enjoyed the moment. Writing a Ten Things of Thankful post does not mean that one is unfamiliar with trials; it is a chance to keep those challenges from becoming too overwhelming. Whether one is on vacation, in the middle of a big move (or both! ), or simply in a humdrum routine, there is much to be thankful for. I'd love to see your own slideshow or written Ten Things of Thankful post! Feel free to join us! ...and coasters for the iced drinks and, sometimes, Planter's Cocktail Peanuts (with the metal key on the bottom for producing razor-sharp strips of metal...lol). Surely a busy and enjoyable week(plus), no? I said something in a comment on Ladyleema's post this weekend about the difference between photos in magazines and other publications, all professional photographer-taken and photos from friends of the same places. How the difference, i.e. one has people we know in them somehow, makes a very real and significant difference. The connection, perhaps, through someone we know and a place we've never been. I thought about adding in fondue, but thought that might be too much. Yes, it was a busy almost 2 weeks, but very enjoyable! What a great photo of the two of you and three of your kids. The one of the two of you kissing your daughter is adorable too. I'm wondering if Cinderella's Fairy Godmother rereads some of those wishes. I imagine she could write a book. I'm sure she could write a book! Fantastic photo show, Kristi. Being with family, no matter where, is always special. I love the photo of you and John at the end. It shows happiness and contentment. What I love about photography is that it captures on specific moment in time that you cannot live again. Congratulations to your daughter on her law school graduation. Like the fairy godmother, I will keep her in my prayers. Thanks, Val! Prayers are always welcome and appreciated. Wow! What a trip, from one side of the country to the other. I thought those characters never spoke and, as I couldn't see them approaching, always felt uncomfortable when they did. Yet, I have been to Disney World twice and other parks, but Florida three times. I gotta say though, that nobody loves Disney more than your family I'll wager. Such a special way to celebrate such an outstanding achievement of your eldest. I have been to two glass makers in recent months, in Mexico and in Whitehorse, Yukon. I wish I could see the way glass sparkles, with its colours, so thanks for describing the ceiling and everything else so well. I've said it before, but I'll say it again that your photo descriptions mean a lot. Letting me take part, in some small way, in your family slideshow. Thank you. The "fur" characters, those in a costume that covers their faces, generally do not speak. (I guess Disney World experimented with having Mickey talk, but I've never heard him.) "Face" characters, those who are dressed up but with their faces visible, usually do speak. I'm glad that you find the descriptions useful. I want my blog to be accessible to all. This was fun for me because this time last year we attended our daughter's graduation from dental school and as part of our time together visited the Chihuly exhibit in OKC! Congrats to your daughter (and her proud parents)! What a coincidence! I was so impressed with the beautiful glasswork.